The school holidays have nearly finished but that doesn’t mean the fun stops – Miffy has just launched a new arts and crafts range, perfect for rainy days! If you’re looking for a stylish school backpack for the new year, a cute selection of Miffy backpacks have been released – one even includes a dough play set. This Miffy Art Case would make the perfect gift for a creative little Miffy! It comes complete with crayons, felt-tips, pencils, rubber, ruler, scissors, stamps and lots more to entertain your little one for hours. View it HERE. Children (and adults) will love colouring the world with these bright and cheerful marker pens – don’t worry, they’re washable too! The set is perfect to put in a school bag or pencil case, or to use during a rainy day. View it HERE. Little messes are no problem with this stylish apron. Spend your day painting and getting creative without getting too messy! View it HERE. 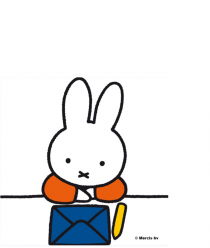 Have all the fun with the Miffy Poster Set. Paint your own picture of Miffy, leave to dry and then put your finished artwork in a frame on your bedroom wall. View it HERE. Be the envy of your friends with this NEW Miffy plush backpack, suitable for children *and* adults. This cute-as-a-bunny backpack has one large zip pocket for storage, with adjustable shoulder straps for comfort. These wonderful Miffy backpacks make the ideal school bag – they’ll fit all the school essentials, like books, stationery, homework and lunch. The backpacks have one large zip pocket for storage with adjustable shoulder straps for comfort. View them HERE.